Returning to original sin: Whither Lanka’s Test Cricket? Grant McCann Erickson (GME), Sri Lanka’s pioneering advertising agency, celebrated its 55th anniversary earlier this month. A power house today, the company has grown into a leading integrated agency network that covers the wide spectrum of marketing communications services, according to a statement from the organisation. 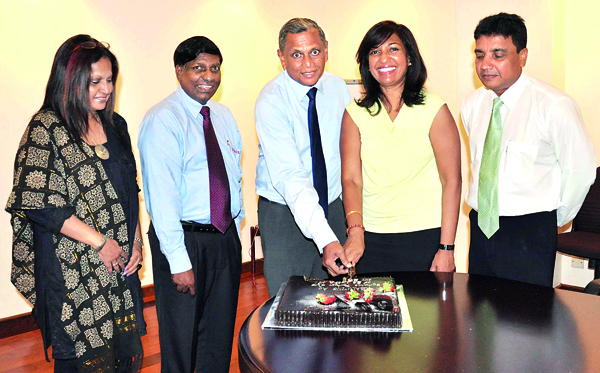 Pic shows - Ms. Neela Marikkar, Chairperson of the Grant Group of Companies and Hemaka Amarasuriya – Chairman of Singer Sri Lanka cutting a cake in celebration of their five decade long partnership. Also present are Ms. Laila Gunesekera, Vice President of the Grant Group, Asoka Peiris, Group Chief Executive Officer of Singer Sri Lanka and Nasser Majeed, Marketing Director of Singer Sri Lanka. “Exploring new ways of reaching our consumers has been the most exciting challenge for us over the years. From when the company first began consumers have evolved and staying relevant in their life has been a challenge for both brands and agencies,” said Neela Marikkar Chairperson of the Grant Group. The company said another unique aspect of the agency has been their enduring relationships with their clients. On its 55th anniversary the management of Grant McCann decided to celebrate this milestone with oldest client Singer Sri Lanka, a partnership that has spanned 54 of the 55 years of the company. Sharing a piece of cake both Hemaka Amarasuriya Chairman of Singer and Neela Marikkar reminisced about the five decades-long journey both organizations have taken to reach the top of their league and continue to stay there. “The ethos of our company is to maintain long-term relationships with our clients, many of which have lasted several decades. Singer has been our client since the very beginning and our relationship has lasted over two generations,” said Ms. Marikkar, whose father Reggie founded the organization. Apart from long-standing clients, GME has a number of long enduring, committed individuals as well. The homegrown stars at GME includes Laila Gunesekere – one of the most recognized professionals in the industry who has been with the company for nearly 30 years, moving from client-servicing to creative and finally moving up to Vice President of the Group a few years ago; Romesh Fernando the financial wiz for the past 24 years and Russell Miranda – GME’s Executive Creative Director who has spearheaded many of the company’s award winning campaigns over the past 20 years. Drop in Gold Price: A plan for another round of Quantitative Easing?